The Sidebar: More re: the "viral Heimlich" story: Mystery meat at the Deupree House -- and is my father dating the "ostensible choking victim"? More re: the "viral Heimlich" story: Mystery meat at the Deupree House -- and is my father dating the "ostensible choking victim"? 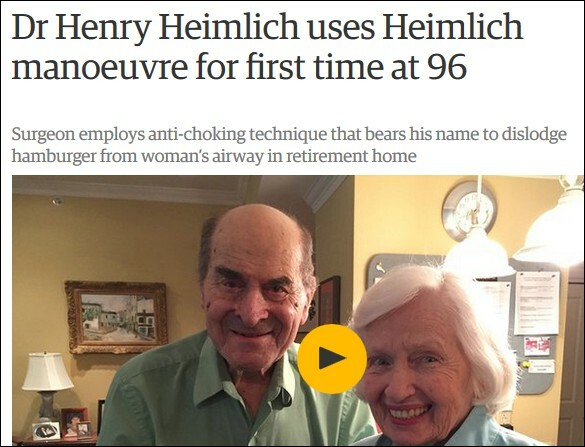 I've got two problems with the May 27, 2016 Guardian article by Joanna Walters, Dr Henry Heimlich uses Heimlich manoeuvre for first time at 96. The second problem is a bone I have to pick about inattentive reporting. The first problem's the headline and the lead. ...(On Monday, May 23) the retired chest surgeon encountered a female resident at his retirement home in Cincinnati [the Deupree House] who was choking at the dinner table. Per the videos at the end of this item, my father, my brother Phil, and 87-year-old Patty Ris (the "ostensible choking victim" according to Slate) claimed this was the first time my father saved the life of a choking victim using his namesake maneuver. Partly as a result of my efforts, that claim was swiftly debunked. From 2001-2006, my then 81-year-old father told reporters from the Private Clubs Newsletter, Chicago Sun-Times, BBC, and the New Yorker that he had Heimlich-ed a choking victim in June 2001 while having lunch with a friend at the restaurant of Cincinnati's Banker's Club. If my father -- no slouch when it comes to ginning up press coverage -- had shared that information with Cincinnati reporters, obviously it would have gone viral, just as the recent story did. But the Banker's Club tale was never reported by any news outlets in Cincinnati. As my father undoubtedly realized, local reporters would have fact-checked it. Inevitably, talk turns to (Dr. Heimlich's) “latest maneuver” - his upcoming autobiography, Heimlich’s Maneuvers, to be published shortly by Bartleby Press. ...But there’s one anecdote you won’t find in Heimlich’s Maneuvers - the doctor’s own use of the Heimlich maneuver to save someone’s life. The famous doctor has never had the opportunity to administer the maneuver on a choking victim - yet. Dr. Heimlich himself said the other day that he has performed the move only once, in Cincinnati. Also, my wife Karen and I were on reasonably good terms with my family in June 2001, when the Banker's Club incident supposedly took place. If my father had saved a choking victim with "the Heimlich," wouldn't he or another member of my family have told us? 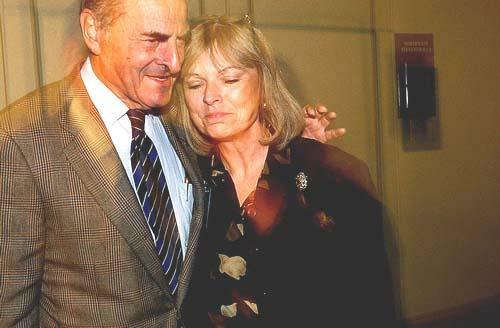 "All I can say is none of us had a recollection of it," Phil Heimlich said. "If dad did it, I would’ve heard about it." No surprise to me, my father -- an abject coward -- is now hiding from questions about his earlier claim. 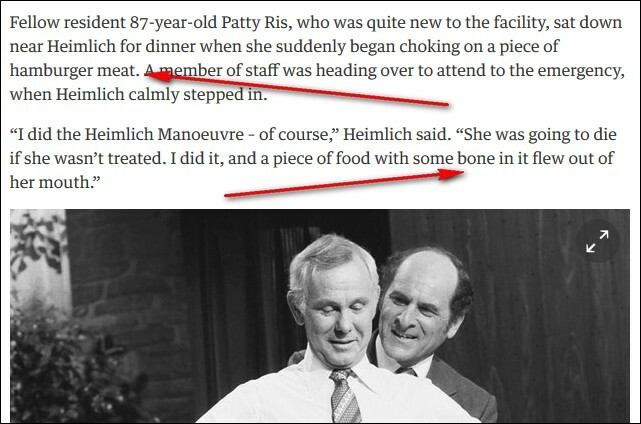 A BBC article in 2003 quoted (Dr. Heimlich), then 83, describing a similar encounter where he tried the maneuver on a fellow diner, a man, although the story lacked details such as a precise date, location and name. A New Yorker article in 2006 made reference to a similar incident, also without details. But a son, Phil Heimlich, said his father had never mentioned any previous incidents to him. The doctor himself did not return a follow-up call. If my father's quote is accurate, either the local department of health should be notified that the Deupree House is serving substandard hamburger meat -- or my father didn't keep his story straight. I know plenty of reporters and editors who wouldn't have let that one get by without a follow-up question, especially when the source has a history of lying to the press and publishing phony case reports (here, here, and here). But it's not to late for the Guardian or other news outlets to ask Dr. Maneuver to clarify. If any reporters do ask him, maybe he could also respond to this? 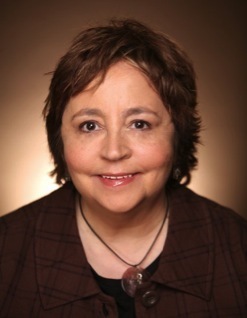 Slate and McKnight's have questioned whether the May 23 choking incident at the retirement may have been a publicity stunt staged as a tie-in to "National Heimlich Maneuver Day" which fell only a week later on June 1. How else to perhaps get to the bottom of the mystery -- and the mystery meat? On Monday evening, when a woman who happened to be sitting next to him in their upscale Cincinnati retirement community choked on a piece of hamburger, 96-year-old Heimlich sprung into action. "I immediately knew she was choking," Heimlich told NBC News. "I just realized, I've got to go over and save her." ...(Patty Gill) Ris, a former third-grade teacher who just moved to Deupree in March, hadn't met Heimlich before that night. But was that night really the first time they'd met? Spizzirri's post is dated just six days after the May 23 purported choking incident at Deupree House. Either my father's a fast worker or perhaps he and Patty Ris bonded after defeating the life-threatening hamburger. Or was it the meat with the bone in it? Incidentally, "former third-grade teacher" Patty Ris was married to a prominent and apparently well-heeled business owner, the late Howard C. Ris. According to a January 13, 2012 remembrance, he enjoyed "life in his home at the Country Club of Florida in Boynton Beach, Fla. [just south of Palm Beach]; where he and his devoted wife of 34 years, Patricia (Gill) Ris have lived since 1983." Those who know my father well are aware that he's always had a thing for women with money. For example, my mother, the late Jane Murray Heimlich -- who my father cheated on throughout their 50+ year marriage -- was the daughter of dance studio mogul Arthur Murray. My advise to Patty Ris? My father already set you up by failing to tell you his Banker's Club tale. If you stick around for more, you've got no one to blame but yourself.